A couple of months ago one of my Photofocus posts Fifteen MM Fisheye Fun touched on how versatile this seemingly special purpose lens is. Here’s more. Fisheye lenses come in two flavors, curvilinear and circular. A circular fisheye lens shows the photograph as a circle. All lenses project a circle on the sensor. Their circles are so big that the camera’s format provides the borders. If the lens were on a much larger sensor, the image would show as a circle. Back to the circular fisheye. These lenses have such a short focal lengths that they don’t cover the entire format of the sensor. Hence the photo is a circle in the center of a black border. The fisheye I love is curvilinear. It’s a fisheye that covers the entire full frame sensor. It still curves the horizon line even when the lens is dead level. Since fisheye lenses have no straight lines, when the camera is tilted down the subject will appear to sink into the ground.Tilt it up.and the subjects seems to rise up from it. 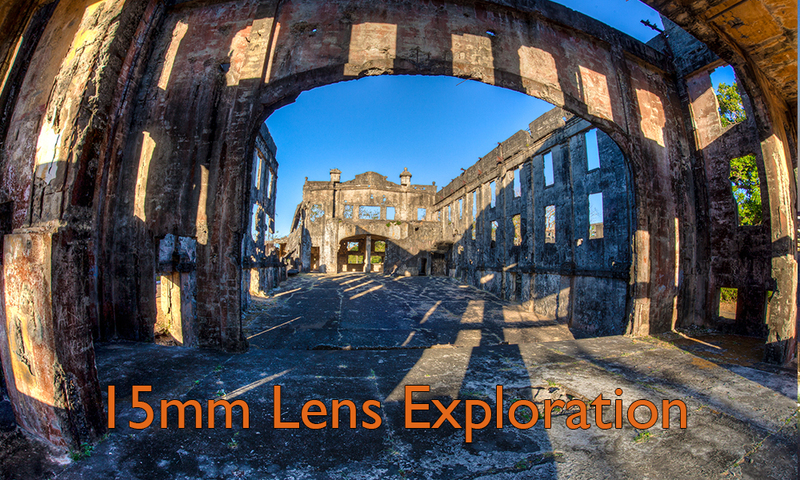 These photographs of the ruins of the Mile Long Barracks on Corregidor Island in the Philippines, show the effect. Even lines running through the middle of each image still have a slight curve as shown by the red graphics. Recently, Sigma published my in depth lens exploration of that very lens, the 15mm f/2.8mm EX DG full frame fisheye. This link goes directly to it. The exploration is not a sales pitch. It’s a longer form look at a lens that goes everywhere my camera bag does. I don’t use it every time I shoot. Because it’s with me, when I put the 12-24mm on my camera, I also expose a few frames with the fisheye that allows me to tell a story that just can’t happen with even an ultra wide angle lens. For instance, I was photographing a construction site. Concrete was being pumped to fill in foundation footers. The footer in the foreground is a foot in front of me. The boom arm of the pump is sixty feet high. The only way to show all the parts was with a full frame fisheye. The starburst is an added bonus when the sun is in the shot. Winter is coming to Atlanta. Snowfall here is never a sure thing. I’ll be ready to show a fantasy view when, no, if it does. This is a photo realistic HDR made with Photomatix Pro from one of our partners: HDRsoft.